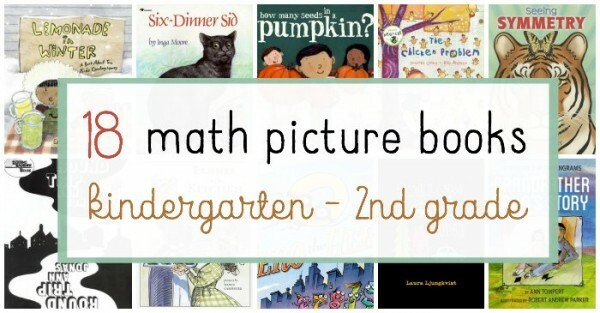 In this series of math book lists, we move on now to math picture books for kindergarteners through second grade. In my list of math books for preschoolers I mentioned that there is no shortage of math picture books. The trick, for me at least, is to find books to teach math concepts that are not boring. I confess that I am partial to math books that incorporate concepts into engaging stories, or books that challenge kids to see math in the natural world around them rather than “math teaching books.” That’s my preference, although both have their place. 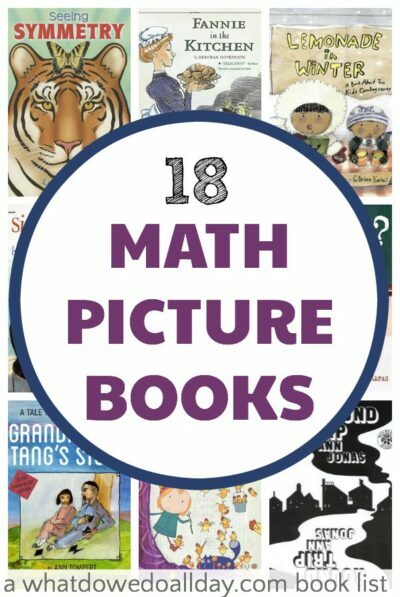 I’m hoping that whether you are a parent or a teacher, the math picture books on this list will help you, whether you have a specific teaching goal in mind, or simply want to expose your kids to the wonder of math all around us. These books sneak in concepts that will help kids build a strong foundation for learning how to calculate. Simple addition, skip counting, a bit of multiplication, as well as counting and place value steal the show. Lemonade in Winter: A Book About Two Kids Counting Money. I know, it sounds crazy to set up a lemonade stand in the snow, but these young entrepreneurs will not be dissuaded. Your kids will be singing a catchy little tune, setting up their own stand and counting their change by the time you finish reading. Zero the Hero is a joyful book. Zero proclaims himself a hero, but the other numbers just aren’t buying it so Zero goes on a mission to prove himself. This is a fun book to spend some time over, with lots of clever dialogue and asides in speech bubbles. Tom Lichtenfield’s illustrations are great fun. The Chicken Problem. I don’t mean to sound like a snob (it just comes naturally, ha ha ha) but I didn’t know about the PBS show, Peg and Cat, which leads me to the chicken and egg problem… which can first the book or the show. The book… I think? Anyway… Peg and Cat like to solve problems and one day when the chicks get out of the coop, there are a lot of problems — math problems — to solve. Lifetime: The Amazing Numbers in Animal Lives is an interesting look at numbers in the animal world. I always think cross-disciplinary learning is one of the most effective means for kids to explore their passions. Numbers kids will enjoy reading about animals and nature kids will start to connect to the mathematical world. How Many Seeds in a Pumpkin?. Despite the focus on numbers and classroom calculations, I really love this book about a class that compares how many seeds are in each child’s pumpkin. There’s enough skip counting, addition and estimations to keep even the most dedicated little mathematician happy. Each Orange Had 8 Slices is one of those “obvious” math books. There is no doubt that this is a picture book that teaches a math concept! Somehow, however, I didn’t find it boring. Perhaps it was the bold illustrations, perhaps because my sons both loved it in their turn. Simple “word problems” encourage kids to figure out simple addition and multiplication calculations. Alexander, Who Used to Be Rich Last Sunday. Are your kids as obsessed with money, how much things cost and how long they are going to have to save to get that coveted toy? Well, mine sure are. Money is a terrific everyday tool to teach math and this book will help you along. It’s also an all around fun story. Both my previous math book lists also included a number (pun!) of books about patterning. It’s such an important mathematical concept I wanted to find books that continue to help kids look at patterns in the world around them. Symmetry, measurement and early geometry are introduced at this age. The Greedy Triangle. If you’re looking for math picture books, chances are, you’ve already come across this one. I’m not the biggest fan of this book’s illustrations, but I do like the way it demonstrates different geometric shapes, and there is a very useful end note. Round Trip is a fascinating look at reflection and symmetry. The book is meant to be read forwards, then turned around and read upside down. My son studied this book for ages when he first picked it up, examining how the mirrored images created two stories. Grandfather Tang’s Story. Tangrams are a wonderful hands on way for kids to explore geometry. In this story about two shape-shifting fox fairies, kids see tangrams in action and will be motivated to create their own pictures with the traditional puzzle shapes. Fannie in the Kitchen: The Whole Story from Soup to Nuts of How Fannie Farmer Invented Recipes with Precise Measurements. We all know that cooking involves a lot of math, and this book is a nice way to introduce just why math and proportions are important to recipes. There aren’t a lot of historical fiction picture books that you can also use to teach math so grab this one! Six-Dinner Sid is a well-read book in our house and perfect for preschoolers through first grade. Sid is a cat who has six owners, gets six dinners, has six names and has to go to the vet six times. Patterning in the text and simple counting are seamlessly woven in. Kids won’t even realize they are strengthening their math skills. Follow the Line is a classic book in which a single line creates a multitude of scenes. While this may not seem like your typical math book, the illustrations reinforce spatial concepts and geometry. Plus, it’s just really cool. Seeing Symmetry is a lovely look at the symmetry all around us, from animals to words to patterns on fabrics, and more. Kids are introduced to the concepts of horizontal, vertical and even rotational symmetry. End notes explain the concept further, as well as give activity suggestions. This is the third installment in the series I am collaborating on with The Measured Mom. 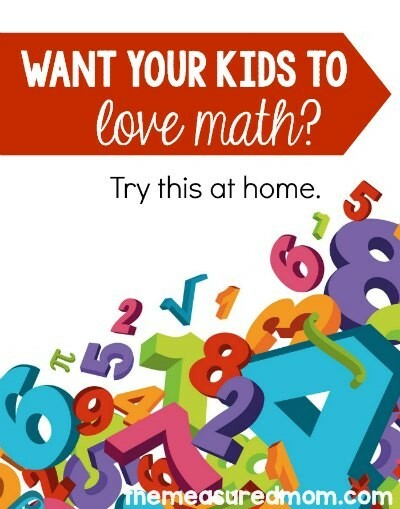 Hop on over to get some quality ideas to help kids continue to love math in K – 2 and avoid the “I’m no good at math!” complaint. If you are new to the series, there are links to previous posts below the photo. As always, you’ve introduced me to a lot of great new books! Zero the Hero is absolutely hilarious and one of our favorites. Six Dinner Sid is one we own and love. The rest are all new, so I’m headed to our library’s website! Love love love this list! I have a fair few counting books (I think Anno’s Counting Book is our fave) but its great to see these others. I’ve already ordered Round Trip and think I will be getting Seeing Symmetry soon too. I would get the Alexander one but we are in Dublin and I need to get my boys counting Euros before dollars! Anno’s Counting Book is one of our favorites as well! I love the independence and self-discovery it promotes. You’re welcome! I’m glad the book list will be useful. Perfect timing! I love your book lists and this one has come at just the right moment! I’m teaching math to the kids in our local homeschool coop and it’s always a struggle to find engaging material for our kids (who range in age from 5-8). I’m definitely going to grab some of these from the library. Our kids also got a real kick out of the folk tale “One Grain of Rice” which is also about the power of doubling. Keep the lists coming, please!! Good luck with the math teaching! I love One Grain of Rice, too. Infinity and Me is terrific. Great list. I have a math-lover too. She loves At Our House by Isabel Minhos Martins, which also appeals to her interest in all things medical/human body related. It counts how many bones, noses, etc. there are in a household consisting of humans and non-humans. I don’t like the Sir Cumference books at all – except for the titles! I don’t really like the Sir Cumference books either, though everyone recommends them. And Fannie in the Kitchen looks great too. I didn’t realize that it’s by Deborah Hopkinson, whom I love. Thank you, thank you, thank you for the lovely lists. My kids have enjoyed many of your recommended books since I found your blog not long ago, as evidenced by the shouts of, ” I’ll be Tumtum and you be Nutmeg!” despite having finished that book at least 3 weeks ago. These two math lists are especially amazing. Tomorrow I am returning some from your preschool list to the library and picking up some from this list that I promptly put on hold. I’m so glad you have found the lists useful! I love that your kids are engaging in pretend play based on Tumtum and Nutmeg! We enjoy Math Curse. Good through 4th or 5th grade, but my kindergartener likes is. Glad to be able to introduce you to some new books! I have a low ability year 1/2 class with some children who hAve emotional challenges and are struggling with a few basic concepts. They love stories though so have ordered some of these books and will give them a try. I hope they help and how great that the kids have a teacher like you who wants to try new ideas to help them! Great list and very insightful analysis. I had a crack at writing a maths picturebook once and would kind of love your opinion, but I won’t clutter your comments with a link here! I am sorry but I think the list have 17 books. Excellent list! Thank you for sharing. One of our favorite math picture books is “Remainder of One” by Elinor Pinczes. It was given to us by my mother who is an elementary school librarian. It is a winner!